There is so far no searchable/workable website that have the English translation of "Ginga Eiyū Densetsu" (銀河英雄伝説) otherwise known as "Legend of the Galactic Heroes". My site is purely devoted to my ambitious project of translating the entire novel (the 10 core books) into English. I am Chinese therefore I can only translate from the Chinese translated books. Using the LoGH webring and its resources, I will try to translate as accurate and sensible as possible. Long, long time I didn't have any update. My private life is dragging me down as a new member had joined my family and is draining all my energy, if you know what I mean. I don't know when I can start more translations. 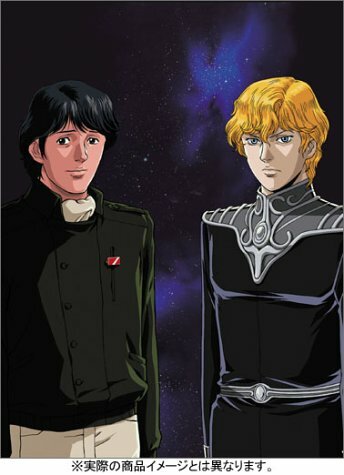 The most I can do right now is hope people email links of other people's translations of LoGH to me so I can promote them here. Sorry folks, looks like this site is going into hibernate mode for a long while. But I'll continue to translate again, someday (and hopefully tripod.com still there when that happens). Cheers everyone and good luck in your search for LoGH related materials. A bit of good news! Thanks to a LoGH fan, Kakyou, here is a reasonably stable link of another LoGH translation project. Though, I will continue to translate on my own, but this link will definitely quench more of our LoGH thirst. It is in the new Link page that I've setup. I thank everyone for their support and please, continue to sent more links so everyone can enjoy LoGH even more. I have been kidnapped by work and family issues. I need a Reinhart or Yang to save me!!! Seriously though, it has been way too long for a update. I'll try my best to finish the next chapter which is still in the middle. If anyone has found any other English translations past Book 1 Chapter 7, please email me so I can post the link to that website and spread the joy of LoGH to others. Chapter 7 is now available for download. Will start on the next chapter as soon as I can. I've fixed two minor names in Chapter 6: (Kastrop System & Duke Mariendorf). There you go people. Chapter 6 is available for download now. Looks like about every 2 weeks, I can finish a Chapter. Still have an arduous journey ahead but I'm determined. Thanks for all of your support! Well, I've completed and edited another chapter in Book1. Chapter 5 is now up and running. Enjoy. After tired of waiting for volunteers, I had to volunteer myself. So here I present to you, Chapter 4. I'll start on Chapter 5 now. Chapter 3 is now posted. Chap 4 would be in edit normally but my editor is too busy for the next 2 months. So if anyone has moderately high English writing skills, high grades in College Writing courses, and have some free time on their hands, please volunteer and contact me to help edit the following chapter for free using my email address at the bottom of the webpage. Thank you.